There are state and local elections in every corner of America that need your attention. No matter your political affiliation or preference, embrace your civic duty and stretch your sphere of influence -- here are simple best practices for helping others in registering to vote and turning out on election day. 1. Timing, Timing, Timing! : It’s been proven that efforts to get out the vote are most effective in the final weeks and days leading up to the election as voters begin to pay more attention. Do a big early voting push and then really go all out in the final week and on Election Day itself! 2. Remember Your Goal: The goal of your get out the vote campaign is to get as many of your supporters as possible to actually go vote. First, identify your supporters –the people who are already persuaded to support your candidate –and then motivate those supporters to go vote. 3. Voters respond to urgency! : Voters are more likely to turn out because they believe that their vote will make a difference. Use your mission and core issues to highlight what’s at stake, and convince your supporters that every vote counts. 4. 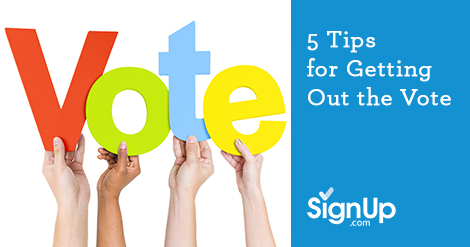 Make it Easy: Don’t let little things keep your supporters from the polls. Make sure you provide all the basic information-- like where to vote, when the polls are open and what kind of identification is necessary-- to make voting as easy as possible. Consider volunteering to drive voters needing transportation assistance or refer them to ride sharing companies and nonprofits providing free rides on election day. 5. Make it Personal: Research shows that people are more likely to vote when contacted personally by someone they know. Call your circle of influence or use social media to ask your contacts for their commitment to voting. Vote early and post photos of yourself wearing your “I Voted” sticker on your social media accounts to spark participation on election day. Remember to use positive messaging to encourage people to vote –no shame or blame. Remind them of how their vote matters to your community’s future! Whether you are starting a grassroots effort, or working on behalf of an established organization with a vested interest in who will be setting policy, use SignUp.com's free online SignUps and coordination solutions to organize volunteers and neighborhood canvassers. Create a SignUp and keep track of volunteers, their shifts, jobs, hours and even track where they will be working! Canvassers can sign up other volunteers in the field from their smartphones or tablets. SignUp.com provides real-time e-calendar syncing and automated reminders, making volunteer coordination the easiest part of getting out the vote!